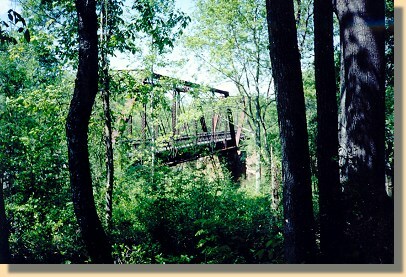 Staunton River Bridge - 2001 (3). View from Confederate Rifle Pit. On June 22, 1864 the cavalry divisions of Brig. Gen. James Wilson and Brig. Gen. August Kautz were dispatched from the Petersburg lines to disrupt Confederate rail supply lines. Gen. U. S. Grant knew that if these supply lines could be destroyed, Gen. R. E.Lee would have to abandon Petersburg. The Federal troops left Petersburg with over 5,000 cavalry troops and 16 pieces of artillery . As they moved west, pursued by Confederate General W. H. F. "Rooney" Lee and his cavalry, Wilson's cavalry tore up 60 miles of track and burned two trains and several railroad stations. Just south of Roanoke Station (present-day Randolph, Virginia) was a long, covered railroad bridge over the Staunton River, Wilson's final objective. 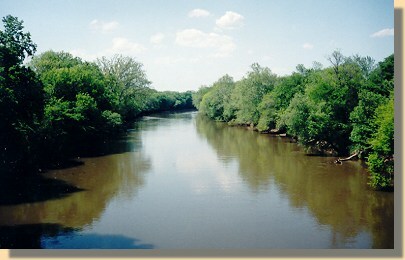 The bridge was defended by a battalion of 296 Confederate reserves under the leadership of Captain Benjamin Farinholt. On June 23rd, at 10 p.m., Capt. Farinholt received word from Gen. R. E. Lee that a large detachment of enemy cavalry was moving his direction to destroy the bridge and that he should "make every possible preparation immediately." That night, Captain Farinholt sent off circulars urging the citizens of Halifax, Charlotte, and Mecklenburg counties to assemble for the defense of the bridge, and ordering all local companies to report immediately. As a result of his circulars, by June 25th Capt. Farinholt's command had increased to 938 men including 492 citizens. Farinholt was still badly outnumbered. He had only six pieces of artillery, four were in the earthwork fort on the hill just east of the bridge, and two in a small fortification west of the bridge. Between these artillery positions and the river was a line of trenches, and across the bridge there was another line of hastily constructed but well-concealed rifle trenches. Confederate Captain James A. Hoyt with his two companies of regulars were on the east side of the bridge, and Colonel Henry Eaton Coleman's "Old Men and Young Boys" were on the west side. Scouts and pickets were posted north of the bridge near Roanoke Station. The Mulberry Hill plantation was located on a commanding hill near the battlefield and the grounds of the house served as the Union headquarters and field hospital during the battle. It is said that Mrs. McPhail, the lady of the house, told the Federals that 10,000 Confederates lay in wait for them beyond the breastworks and that every train was bringing more. The Union cavalry arrived on a hill above the battlefield about 3.45 p.m. and immediately opened with rifled Parrotts and 12-pounder Napoleons . The shells striking the thin roof of the bridge made a fearful racket, scaring some of the small boys into outbursts of weeping. General Kautz's cavalry troops were dismounted north of the bridge and formed up to cross the open fields toward the bridge. They were receiving heavy fire from the Confederate artillery on the other side of the river. Colonel Samuel R. Spear's 1st D.C. and 11th Pa. approached along the east side of the railroad and Colonel Robert M. West's 5th Pa. and 3rd N.Y. along the west side. The Union troops reached a shallow drainage ditch some 150 yards north of the bridge, and organized for what was to be the first of four separate charges, all of them repulsed by the badly outnumbered Confederate forces. When the Union forces left the drainage ditch for their first assault on the bridge, they were met by intense fire from Col. Coleman's old men and young boys and the regulars who had been hidden from view in their shallow trenches around the bridge. It was during the fourth charge, when there was some misgivings about the results, that General W. H. F. Lee and his division struck the rear-guard of the Federals, causing them to have to fight in two different directions. Finding that the Staunton River Bridge could not be carried without severe loss, if at all, the Confederate cavalry being at their rear, and the Staunton River too deep for fording, Union General James H. Wilson decided to discontinue the battle and return to Petersburg. The withdrawal started around midnight. The next morning, the Confederates advanced their line of skirmishers half a mile and discovered that the enemy had left quite a number of their dead on the field. 8 Union soldiers were captured and 42 were buried. The reported Confederate losses: 10 killed and 24 wounded.